People fantasize every day, often about love. I believe that’s a healthy thing to do, and practical. So long as we can conceive of better things, we’ll continue looking for them in the vast, perceptible space beyond our heads and homes. Our only other choice is to close down, settle, and get weird. Wong Kar-wai’s Chungking Express is about four single people coping with loneliness. Two are young, their fantasy lives still freshened with hope, and two are older, wiser in some ways but narrow-minded. They form two pairings, told in two stories that barely intersect. All are lost in their own lives. Story One introduces us to a young Hong Kong police officer, ‘Cop 223’ (Takeshi Kaneshiro) and an unnamed heroin smuggler played by Brigitte Lin. Cop 223 is not a profound thinker. He’s made it to 24 without much wisdom, and, we suspect, little experience with serious women. Lin’s smuggler is serious and then some. Handsome and confident, Cop 223 can’t conceive of a world in which he could be peripheral. His girlfriend dumps him on April 1st, a month before his birthday, and he vows to buy a can of pineapples (her favourite fruit) every day until May 1st. Every can must expire by his birthdate. He assumes his ex will resurface in time to make all this nonsense worthwhile, and when she doesn’t, he starts phoning up old flames, some of whom he hasn’t seen in years. One is married with kids. He’s astonished. The smuggler just wants out of her life. She remarks (to herself) about how cautious she’s become—her outfit is a costume of dark glasses, a blonde wig and tan raincoat; all of it recognizable, but all of it easily shed, leaving a totally different looking woman free to slip away. She wears this getup all the time, for she’s constantly threatened. For someone so paranoid to let her guard down before Cop 223, even for a moment, for any reason—even exhaustion—implies a suicidal impulse. Cop 223, despite his harsh line of work, couldn’t imagine such nihilism. He discovers her in a bar, on his off-hours. He asks her if she likes pineapples, which would mean nothing to anyone but him. But he’s also decent at heart, and that profoundly affects this woman, for whom decency is so rare. In story and in execution, Chungking Express is a film with multiple angles and points of view—we see characters through windows and from both sides of a lunch counter; hear them speaking in several languages; receive first-person narration from all four major players in scenes mixing comedy, romance, and noirish drama into one soup. 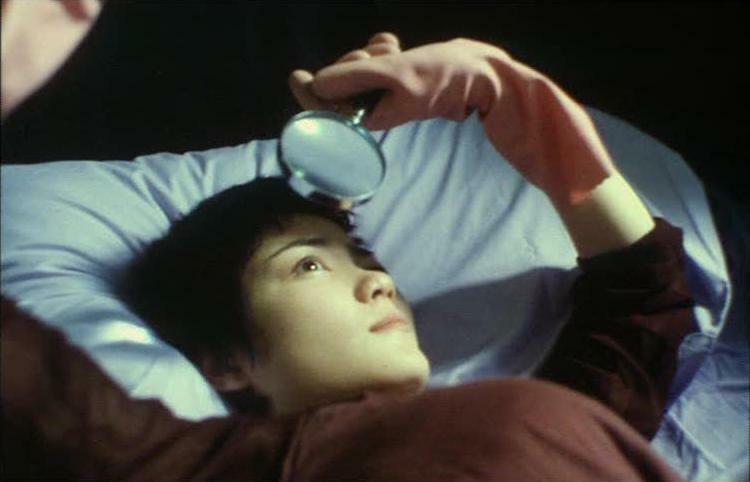 With cinematographers Christopher Doyle and Wai-keung Lau, Wong Kar-wai shuffles his long takes of a buzzy and neon-lit Hong Kong with frantic moments of rapid cutting, and other moments where the actors slow to the stillness of a painting. This is how the real world feels, if not literally how it looks, and we all have to accept it. Is it the stuff of romantic fantasy, though? Is fantasy about seeing things lots of different ways? From someone else’s perspective, perhaps? Nope. Romantic fantasy is about crafting ideal situations and an ideal character, one holding ideal feelings for you. It does not benefit from equivocation. The characters of Chungking Express must negotiate this gap. Story Two is longer, sweeter, much funnier. Another policeman, the fortyish ‘Cop 663’ (Tony Leung), visits a lunch counter almost every day. He lives alone in a cluttered apartment, having recently split from a beautiful stewardess (Valerie Chow). Like Cop 223, Cop 663 misses a lot. It’s hard to tell, for example, how much he notices Faye, the only female behind the counter, and a cute one at that. 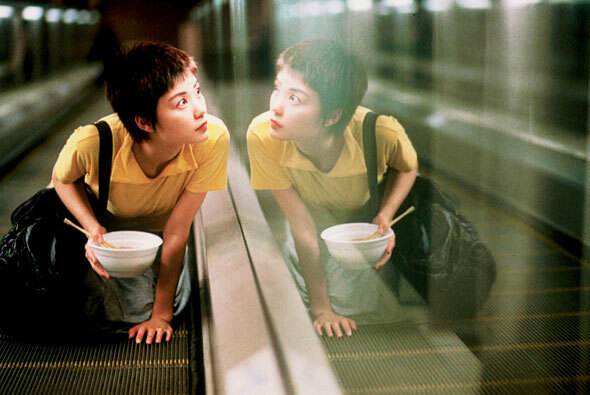 Maybe Faye (Faye Wong) is too strange for him, or just too unconventional. She blasts music while she works—so loud she can barely hear customers’ orders; so loud, she explains to Cop 663, that she ‘doesn’t have to think.’ Her song of choice is “California Dreamin’ ”, which also describes her state of mind. She wants to live in California, and by playing this song over every conversation she’s having, she’s making sure everyone knows it, even if she’s too shy to say it. Faye treats music like some people treat alcohol. Cop 663, meanwhile, has grown idiosyncratic. He looks for meaning, even messages, in the inanimate objects around his apartment. He talks to them. He chides the soap for wasting away and the stuffed Garfield toy for being dirty; his toilet overflows and he wonders what volume of grief could make an apartment ‘cry.’ He needs someone in his life, soon. Changes are occurring in Cop 663’s home, but does he see them? Some, like the suddenly polished fridge door, are incremental. Others, like the growing number of goldfish in his aquarium, must be obvious. Maybe he blames his hot ex, still in possession of a key, working up the nerve for a rendezvous. Or maybe Cop 663’s indulging in another fantasy, one peculiar to the bachelor male: the Invisible Housekeeper. Either way, he’s been burned by the world, but not to the point of hating it the way Lin’s smuggler does. He just needs someone to make the first move—someone who can break the rules a bit. Speaking as a man, Faye would be a very acceptable someone. You’ve noticed the vague naming of lead characters in Chungking Express. The movie is equally fluid in its naming of other things. Cop 223, for example, pursues two woman named May, both of whom share the name of his birth month, while Cop 663 and Faye meet (sort of) in a restaurant called ‘California.’ I mention this because I'm a silent movie blogger here, and it is a trait of many great silent films to do away with names. Names specify limits, boundaries—they tell you who or what something is, and at the same time, what it cannot be. This specificity is out of place when one is dealing in universal truths, as silent films often do, and as Chungking Express does. Chungking Express, set in a certain place and time, is nevertheless about a timeless thing called love, and the hope required to make it real. Chungking Express will have an exclusive engagement at TIFF Bell Lightbox for at least one week, starting Thursday, April 21st, 2011. Cinematographer Christopher Doyle will be on-hand to discuss the film, and his own award-winning career, on April 23rd. Today I have visited your http://silent-volume.blogspot.com/ and found some interesting information.We think our visitors will be benefited by your sites information.Hope by exchanging link we will be able to promote each other sites. We have added your link in our blog http://international-movie-list.blogspot.com/, and please you too add our link and once done, let you know me where you have added our link. Thanks for your valuable time to read our mail. I will look forward to hearing from you soon . Nice review of a most interesting film.